THE WRITING BUDDHA - Opinions | Books | Movies: 1500* BLOGS in 2589 Days with Lakhs of You!!! In the world of noise, chaos and screaming, we close your eyes. We sit with a posture and chant one mantra for a long time without thinking about anything that troubles us. Mind fluctuates in the beginning but after some time, the stability becomes the regularity in the composure and we attain the energies that we never knew stayed with us since our existence on this planet. The habit of doing this is called Meditation and we never skip after getting to know its effect in our otherwise chaotic and disorganized life. The moment when we are meditating, we are in quest of nothingness in our mind so that we can hear the inner voices and nothing else. Similarly, 7 years ago, one day, out of my chaotic and disorganized schedule, I found little time to understand how can I share my thoughts with my friends and came to the conclusion that I will create a Blog to write my day to day events. With time and maturity, I started sharing substantial articles, reviews, self-help posts etc. The moment whenever I am writing a blog post, I am in the same state of meditation as I am away from the chaotic thoughts that generally keep interrupting my mind each second. I go into the mode of nothingness where a nice vacuum gets created in my mind out of which the stories start getting formed one after one which in turn gives birth to a new BLOG POST. When I begun writing blogs, I didn't have any ambitions through it except a will that I would never stop what I have started and it would be remembered as the longest marathon ever run by one of the Indian Bloggers in terms of the duration and frequency of posts. It has taken me 7 years to reach to my 1500th Blog Post which is a dream for any blogger to continue writing these many articles. Being a student for 6 years and a corporate employee from last 1 year, there were challenges to take out time to update my Blog after the hectic daily routine but the quest to achieve something out of the residual life which does not even get counted in life of an average human being, I wrote this blog sometimes even at 3 AM. There have been times when I have woken up at 4 AM to write something which makes sense to the readers only when they read it first thing in the morning. I have never woke up this early for exercising, studying etc but I did it for this medium even when there are no monetary benefits out of this. It is just a passion that has never let me sleep if there have been something in my mind which was still not in a Blog Post. And as it is said almost everywhere right from our Holy books to motivational books to spiritual books, if you do something with all your heart, you will eventually get success or fruits from it. But the main motive should be to do something selflessly with pure honesty. I can say it for my Blog that I have never cheated or fooled my readers or any publishers/authors for whom I write. This Blog then gave me so many gifts in life that sometimes when I sit alone and think about this odyssey, I just can’t believe that a medium which got birth just for the sake of letting my friends know my update had such secrets hidden in it. There are several instances where Bloggers have mailed me to ask how to convert their Blog into something like mine so that it becomes popular and readers’ favorite. I have never been able to reply to these mails as I am still ignorant how did this Blog think of gifting me so very great moments in life that can never be forte of a common man just like I was/am. Today I meet celebrities not like their fan but as someone whose portal can fetch them more benefits and therefore they talk in order to request me something rather than me asking them for an autograph or selfie. I get mails from authors who are known for not replying to their fan mails and messages. I get so many great books to read from the publishers who generally don’t care about human feelings when it comes to selecting manuscript of an unknown personality. And recently, my designation at my organization got changed because of this Blog. Yes! You heard it right. Even this did happen and to my surprise, I am no more a Software Tester for which I planned for 2 years to be the one and 6 months in preparing for it. My employer incidentally went through my blog and asked me to do certain tasks that he felt someone with skill set of a Blogger can perform in the organization and changed my designation to a Business Analyst who prepares documentation after gathering client’s requirement and does all the interactions in a Software project life cycle. I still do not know the eligibility or basic requirements of this Designation but I am playing this role in an organization because of this medium. What more can I say about the wonders that this blog have done to my life. Even now when I look back and think if I deserve what I have gotten from this Blog, I only get a negative answer. I still do not have any target from this Blog which I can announce today and promise my readers that I shall achieve the same in next few months/years. But I am sure that my life would be changed many a times again because of this medium. If I take out the moments I have rejoiced because of this medium, my life is not even what a normal student/employee leads. It has been a big bore and worthless. Whatever little worth I have in the institutions and works that I have been associated with is because of the image and personality that this Blog makes people to create about me. Otherwise I have still seen only 1% of what learned men call “world”. I am in midst of several emotions that are going in my heart and mind while writing my 1500th Blog Post. The fraternity of Bloggers may not hold me as someone who has a great literary value but few people who believe in me will definitely stay with me for many years to come because they know how this medium have fledged from a teenager’s cry to self-help posts to opinions about books and movies. I will always respect my readers for giving me time to develop and they still keep reminding me about the genres that I have still not tried on my blog. I feel blessed that people who have never met me are concerned about my versatility and success. What more can a middle-class boy dream of? 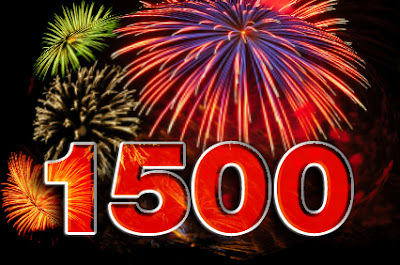 On this 1500th Blog Post, I would like to congratulate my readers because it is result of their patience that someday I would fulfill their requirement by writing a perfect Blog Post which they have been waiting for since joining the medium. Please stay by me as this 15th Century is not the end but just another landmark which have gotten achieved because of the chemistry that you and I share. And I will leave saying what I always say, “Your Support is My Success”.